A singer songwriter from Kouzushima Tokyo. Born in 1980, on a Kouzushima, a small island of Tokyo with a population of about 2000. Upon entering high school, left the island to go to mainland Tokyo. Began performing on the streets in her high school uniform. Gained popularity through word of mouth, and became famous for being a real high school street singer songwriter. In 1999, at the age of 18, just before her high school graduation, made her major debut with the album “Ishida Natsuyo / Album ‘Himawari’”. Became a DJ for the Nippon Broadcasting radio show “All Night Nippon”. Although she released 1 album and 4 singles, sales numbers stagnated, leading to the annulment of her contract with her record company and agency after 2 years. 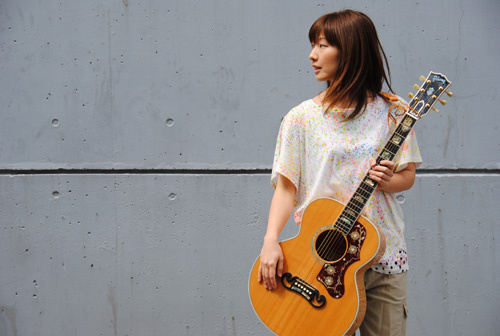 After that, worked as a lyricist for many artists including Hiromi Go, and Yoko Nagayama, until she formed the band “kicca”. Although the band made their Indies debut, due to stylistic issues within the band, the band naturally dissipated. In 2005, with the resolution to, “sing what she truly wants to sing”, she restarted her solo work. Having spent the little money that she had, in 2007, she released her first Indies solo album in 8 years. The album was called “Watashi no Uta”. She also began street performances for the first time in 8 years. Her persistence efforts as an artist gradually began to strike the chords within the hearts of the people. In 2009, 10 years since her debut, made her come back as a major artist with the single “Harusora”. The media took up this previously released song from her Indie days, and she became referred to as the “tear-jerking singer songwriter”, who gave inspiration to listeners about “the importance of never giving up”. Many said that they received “courage to live”.